Lanyards are commonly used to display badges, tickets or ID cards for identification where security is required. 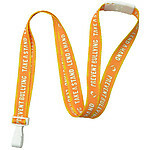 Lanyards are also used at offices, hospitals, stores, prisons and some schools as well as public gatherings such as music concerts, conventions and trade shows. Widths available - Round - 1/8" & 1/4" Flat - 3/8" & 5/8"